Simply The Best Domestic and Commercial Gutter Cleaning Salisbury. Guaranteed. 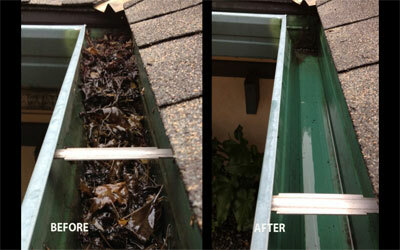 Gutter cleaning in Salisbury is one of our core services. Your guttering is there to do one job and that is to keep rainwater away from the building. If your gutters are blocked that could mean that rather than rainwater flowing along the gutter and away from the building it is overspilling and causing expensive damage like dampness. Our gutter cleaners in Salisbury use a professional gutter vacuum to expertly clean your gutters from ground level. Using telescopic poles this machine creates a powerful suction that takes all the moss, dirt and grime from your gutters directly to our machine. When our gutter cleaners in Salisbury clean the clutter from your gutter all you get is perfectly clear gutters that work exactly as they should. Call us today and we will be only too pleased to answer any further questions and give advice about your guttering. Do you want to book the most thorough gutter cleaners in Salisbury ?